Well written, simple, and detailed documentation for joining, creating, and running LoCo Teams, as well as general advocacy, tips, and tricks. A selection of high-quality posters, banners and other materials. Resources for creating new materials. Presentations that can be used for giving an Ubuntu demo / Charm School etc. This content would make it easier for advocates to get going, instead of navigating the wealth of unorganized content on the wiki and variety of promotional materials. The ADK provides a set of curated content that gets someone up and running quickly. We will include some resources in the ADK such as banners, posters, presentations, templates and more. The idea is to only pick a few of each category (e.g. just a few posters) for inclusion in the ADK but provide a link to further content on SpreadUbuntu. The analogy here is similar to Ubuntu; in Ubuntu we provide a single high-quality text editor, but we provide simple access to alternatives in the Ubuntu Software Center. We can then decide on the best content in the ADK based on criteria such as general quality, brand guidelines etc. One of the motivations behind the ADK is to provide a project that our advocacy community can collaborate around. Our theory is that having a branch that people can contribute to will feel worthwhile as a participant, and we can more easily track issues in the ADK with bug tracking, and also support translations of the content (we can provide localized ADKs). We are using the same technical foundation that has gone into the Ubuntu Packaging Guide. To kick this off I asked Daniel Holbach to create a branch that we can work from, and I spent some time tonight populating it with some initial content. We have lots of awesome content on the wiki, so I started moving it over to the ADK. Very early start to the ADK. Now load _build/html/C/adk/index.html in your web browser and you will see what we have so far. Importantly, although you need to build the ADK here, this would not be the case with each release of the ADK. Normal users won’t download this branch; this will only be the branch contributors use. We will then run make to generate a bunch of .zip files for each translated ADK and distribute those .zip files as part of each ADK release. Each zip file will have a base-level index.html that makes it simple to get started. In the future it could be awesome to have the guide packaged and in the Ubuntu Software Center, and make it accessible in the dash with an icon that loads it in your web-browser. We would also like to auto-generate a PDF of the ADK so users can load it on their tablets/phones/e-book readers. You can see the Launchpad project here. We have a stunning advocacy community, and together we can make the ADK something that is fun, informative, and useful to our global set of teams. As such we are looking for volunteers! We are primarily looking for folks to help with documentation and bringing the best wiki content over to the ADK. We are also looking for some folks to help bring the best promotional materials and presentations over to it. Documentation in the ADK is written using reStructured Text which provides a simple way of adding markup to content (it is similar to Markdown). Included in the ADK is a page that explains how to contribute documentation to the ADK – simply click the How To Help link on the front page. To kick things off we are going to have a meeting on Thursday 13th Dec 2012 at 3pm UTC in #ubuntu-community-team to discuss the next steps in the project. Hope to see you there! What’s exactly the difference with the http://spreadubuntu.org project ? Just a note: SpreadUbuntu is a general repository of materials; the goal of the ADK is to only ship a few posters, banners etc as opposed to the wide selection at SpreadUbuntu. We will then pass people to SpreadUbuntu if they want more choice. The idea here is similar to Ubuntu: provide a few default options (e.g. 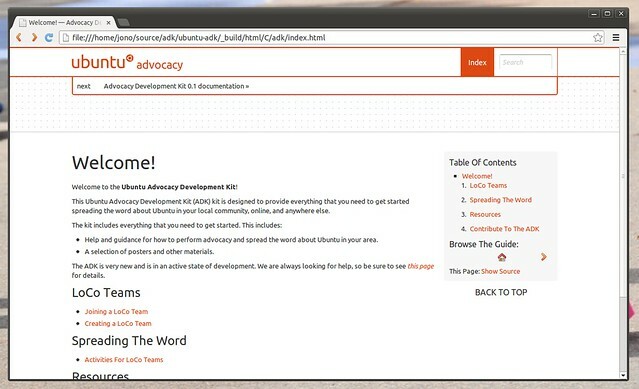 a single text editor) and then provide choice in SpreadUbuntu (e.g. providing further options for text editors in the Ubuntu Software Center). Let’s have a race to the bottom (of HazRoot Spyworth’s funds)! An integral part of this would obviously be localization and multiple language kits (one of the most important points in our design of SpreadUbuntu and its classification system)which will also allow for non-English speaking LoCos to also make use of the Kits in their language. These kits could actually be created right away, as we have thousands of material available, many of which are even translated to many languages. We could probably get on a hangout one day to discuss this a bit more and see how we can contribute to make this a reality and finding common workground for other projects such as the. addition of SpreadUbuntu to Ubuntu Accomplishements so people get trophies for material they share, publish and translate which should be easily done as we do have a way of tracking contributions already in place. Rubén, this is sounds awesome, and well within what we would love to see too. When are you free for a hangout? Are you free on Friday? If so, what times are good for you? I figured out that I have time to join the meeting today, so I will be doing so and hopefully taking with me some other UbuSpreaders to it. After that first base touching I think that we will spot relevant things we can jointly work on and plan ahead. I genuinely take pleasure in your web-site but be sure to verify the punctuation on a number of of your posts. A number of of them are filled with spelling mistakes and I believe it is very annoying to tell the truth but I definitely will come back again. Apologies for that! Can you tell me what on this post in incorrect? Happy to fix it. There are many Ubuntu remixes, which are most times done by a single person. These “new” OSs also bring fame to Ubuntu. Actually, they bring in more fame than its noticed. Ubuntu doesn’t help these people in any way, but these guys are stubborn or resilient and keep on producing such remixes/OSs. They have to pay for servers etc, and sometimes they have to drop the OS/remix for the lack of funds. How about giving more space for them on the Ubuntu web pages and helping them to get about the funds problem? OpenSuse is doing something like that. Nice! Like it from Russia. I’m Brazillian and i wrote two books about Ubuntu. One of them was published in 2010. In 2012 I wrote the second book, bringing Ubuntu 12.04 for Beginners (Ubuntu – Guia do Iniciante 2.0). This book is available at USC and at the Oficial Site the second book has more de 200k downloads. I’m planning to update it for 2013 and publish it under a national editor seal. I already have worked with national teams to spread Ubuntu, making presentations in some events, like the “Forum da Revista Espírito Livre” (a free magazine about Free Software). I hope you see and enjoy the material and if needed, give some tips. Is there a log of the IRC chat that took place on 13 December?